Normally, when I think of gourmet food items, I think of gift baskets full of ready-to-eat goodies. The furthest I've ventured with "cooking" using gourmet food items is using dipping oils for bread or maybe different types of salsa for cooking chicken. You know me . . . all about easy recipes. 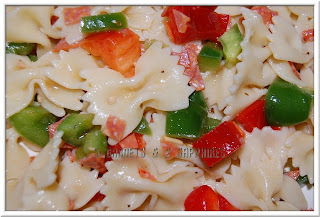 Pepperoni Pasta Salad - This recipe was so easy to make and it is versatile. It uses the Garlic Parmesan Vinaigrette, which is delicious. You can choose which fresh veggies you would like to include to customize this pasta salad to your family's taste. Our children are extremely picky eaters and this pasta dish is one of the few things they are excited to have placed in front of them. I also think this dish is something easy and attractive to bring to the next party you attend. Crispy Italian Herb Chicken Tenders - These chicken tenders were delicious and the recipe only calls for three ingredients! This recipe uses the Italian Herb Cheese Mix. We had purchased more chicken than the recipe called for, so we just added a little bit of Italian bread crumbs and grated Parmesan cheese to increase the quantity of the mix. 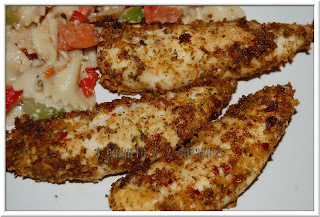 These chicken tenders were another big hit with my family. Garlic Parmesan Pasta - This is another super easy 3-ingredient recipe and it uses the Garlic Parmesan Vinaigrette. I really liked the dish the way it was, but my husband said he would have used more than a 1/4 cup of the vinaigrette. Also, we used more cheese than the recipe called for because my family is in love with Parmesan. 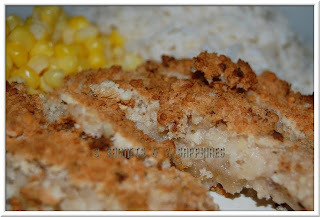 Garlic Parmesan Breaded Chicken - Since my family liked the chicken tenders so much, we thought we would try another Two Sisters Gourmet breaded chicken recipe. This one uses the Garlic Parmesan Vinaigrette and the Outrageously Garlic Seasoning Blend. This recipe was not bad, but we much preferred the chicken tenders recipe. It just seemed like the two flavors of the vinaigrette and the seasoning blend did not work well together. 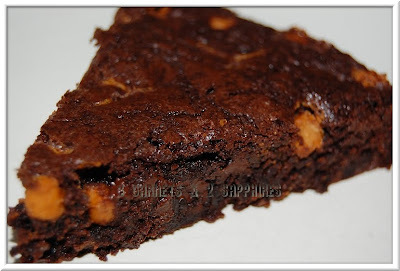 Breathtaking Deep Chocolate Brownie Mix - We did not use a recipe for this product. I was going to try to make the Chocolate Peanut Butter Lava Cake, but realized I did not have the right muffin tin. This mix only yields enough brownie mix to fill an 8" or 9" square pan. I didn't have a square pan, so I used a round cake pan instead. We threw in some butterscotch chips to make our brownies a little different, but I don't think it needed it. This brownie mix calls for butter instead of oil and has chocolate bits already in the mix. The brownies came out great, although I would love to have made a larger quantity in a 13" x 9" pan. To see all of the Two Sisters Gourmet recipes, visit the TSG Recipe Box on the Partylite website. You can purchase these and other Two Sisters Gourmet products through your Partylite consultant. Visit the Two Sisters Gourmet Quick Dishing blog and Two Sisters Gourmet on Twitter to find more ways to use these products. Thank you to Partylite for sending us sample Two Sisters Gourmet products free of charge to base this review upon and for providing additional products for our contest prize. One lucky reader will receive one Two Sisters Gourmet Breathtaking Deep Chocolate Brownie Mix, a bottle of Garlic Parmesan Vinaigrette, a box of Italian Herb Cheese Mix, and Outrageously Garlic Seasoning. Take a look at the easy recipes available for each product in the Two Sisters Gourmet Recipe Box. Then leave a comment telling me the name of a recipe you would like to try. You MUST do this to be eligible to win this contest. 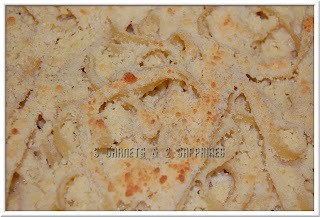 3) For 10 extra entries, blog about this contest linking back to this post AND TwoSistersGourmet.com . Then come back here and leave TEN separate comments with the link to your blog post. 5) For 1 extra entry EACH, follow Partylite Gifts on Twitter and/or fan Partylite Gifts on Facebook. Remember to leave a separate comment for each (with the link to your Tweet or your Facebook profile) if you complete both. This contest will be closed on Thursday, March 25th, 2010 at 11:59pm EST. A random number drawing will be held shortly after. The winner will be announced here and will be contact via email or through their blog. If the winner does not respond within 48 hours, a new number will be drawn.